The first Saturday of December, my family gathers at my grandpa’s house for an afternoon full of food, family, cookies and, of course, milk! When she was alive my grandma hosted her daughters, daughters-in-law and grandkids for a cookie-making day followed by an exchange, which meant we went home with too many sweets (or not enough for those like me who have a sweet tooth). After she passed away thirteen years ago, my grandpa carried on the tradition of letting us invade his kitchen, in the farmhouse that’s been in my family for nearly 140 years. It’s a house that has seen lots of family traditions, meals, football games, and great memories. This year we had 15 adults and 20 kids at our annual cookie event! 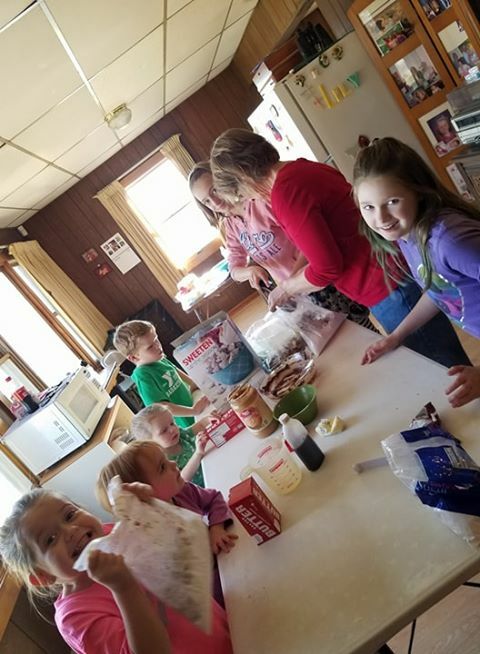 The youngest three are less than a year old so they have many more years of cookie making ahead at their great-grandpa’s house. There were four generations of many branches in our family. 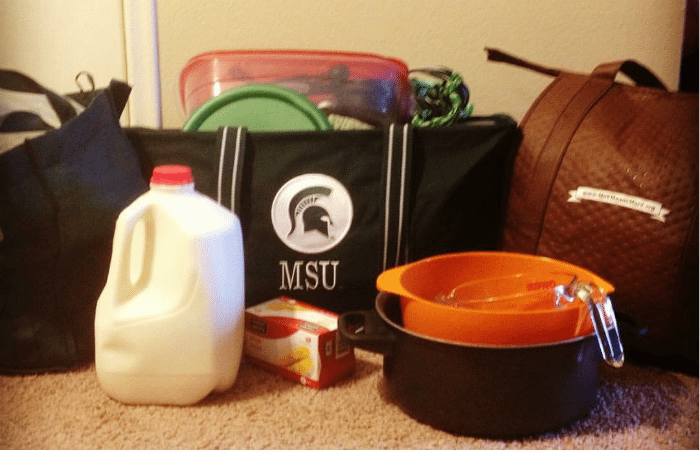 Cookie-making day includes a lot of supplies, including a lot of milk and butter! For the most part we make the cookies, candy and treats ahead of time, but there are a few that are much better if they are made that day. These include the puppy chow that my mom is famous for. 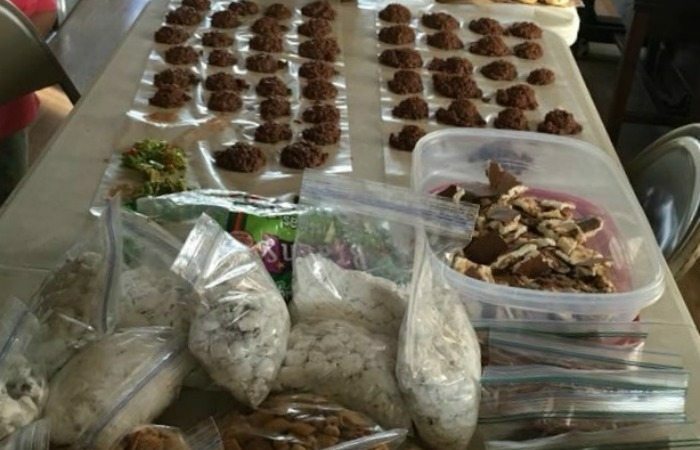 This year, she had quite a few helpers who giggled as they shook a bag full of powder sugar over the chocolate-covered cereal. Christmas wreaths are marshmallow-covered cereal that my cousin molds into wreath form. These were a favorite of our beloved grandma. I make our great-grandma Reed’s no-bake cookies that call for lots of butter and milk. For two years my cookies didn’t meet my high expectations, especially after years of high praise and hearing from family that they were just like Grandma Reed’s. That’s a lot of pressure! But, this year they turned out great. It may have been the four little ones who let their Christmas wonder flow as they helped make the cookies. My mom’s specialty is Puppy Chow. Not only is it fun to say and eat, but it’s fun to make! Photo courtesy of Sara Booth. Then, we move onto decorating sugar cookies. All of the kids took their turns frosting cookies, adding sprinkles and decorating cookies in a way that fits their personalities. This picture is halfway through cookie decorating. Afterwards, we had sprinkles all over the table and the floor that my grandpa will surely be finding for weeks, but the kids had a blast and loved being able to take home their own cookies. 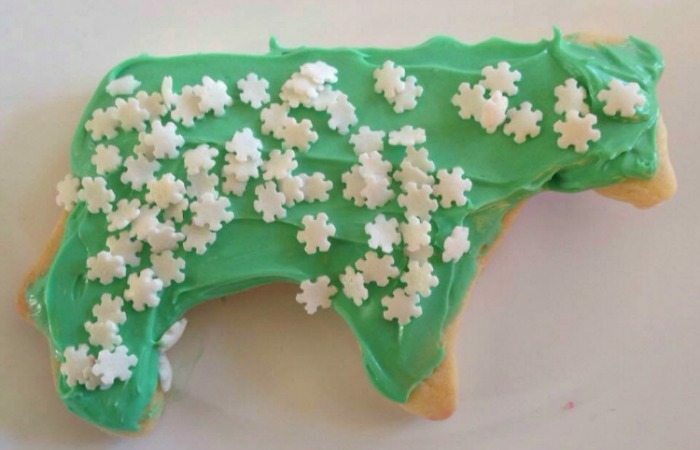 Some years we make cow Christmas cookies. I decorate a few of those to support the MSU Spartans. The day wraps up with the cookie exchange, and everyone heading home with treats to last for days and memories to last a lifetime. Grandpa is usually tired after we all leave but the invitation is always there to invade his house next year, as long as we leave him some delicious cookies to enjoy with his cold glass of milk. *The first photo is just one of the three tables of finished cookies and treats. Photo courtesy of Destiny Bunton. Jolene has the honor to share with Michigan’s dairy farmers how the UDIM team works on their behalf to connect consumers to their products, grow sales of dairy foods and share the good stories of the industry, through her role as Director of Industry Relations. As a life-long dairy promoter and consumer, she knows the importance of sharing dairy’s story and helps farmers make personal connections to consumers through social media, presentations and community events. 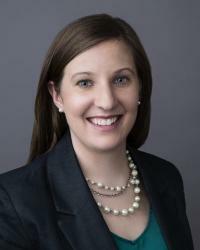 She earned a bachelor's degree in Agriculture and Natural Resources Communication from Michigan State University. Jolene is proud to have started her career on her family’s dairy farm in Hastings, MI, she can be found there often either helping with chores or instilling the passion for dairy onto six nieces and nephews she adores.